Since the last time I did a post about my skin care routine just about errrthing done changed. Well, so my process is exactly the same as it used to be, but the products are, more or less, completely not the same. So I thought I'd do an update and let you all know what I've been using lately. All those fantastic things that people come to blogs for. // 1. ORGANIC COCONUT OIL // After falling a little bit out of love with Dove over the last year (and with the entire Unilever Corp all together), and after reading all about the Internet's love affair with coconut oil, I decided to try washing my face with it one night, fully expecting to wake up the next morning to the break out of the century. Instead, my skin felt great! My pores seemed pretty chill. I used it a few more days and then never went back to soap. It's like we've reached some kind of odd agreement with each other, me and the oil, so I'm sticking with it. I keep my coconut oil in a pretty little jar in the bathroom where it stays pretty warm (strongest heaters in the joint!) so the coconut oil never gets too solid. I use my hands to rub it all over my face (my eyes as well; it's not that fantastic for removing eye make up, but then, lazy), and then I wipe it all off using one of the baby wipes we will never stop buying from Costco in bulk. Ideally I'll learn to use a towel instead of a wipe and save the earth while I'm at it, but then I think of the water that it takes to clean the towels, and . . . did the Universe ever come up with a conclusive decision on that one? I'll have to check. // 2. ORGANIC ROSE WATER // Rather than wash my face in the morning I like to use a "toner" (for lack of a better word) to freshen up and prep my skin for the day. I was using raw Apple Cider Vinegar, but then Brandon asked me not to use it anymore because he didn't like for the bathroom to smell like a salad, so I started to look for an equally natural, but better smelling option. After doing some research I ordered a bottle of rose water and it was just love at first scent I tell you. Rose water is anti-inflammatory, rich in anti-oxidants, naturally cleansing . . it also just feels nice. I keep mine in a spray bottle and spray it directly on my face first thing in the morning. Ahh. I've also used micellar water for this same purpose, which I like a lot and like to keep handy for those mornings when my skin needs an extra boost of freshening, but the micellar water leaves a bit more of a . . . residue? Which is good, I hear? But I don't love it-love it. // 5. KIEHL'S BB CREAM // I consider this a "moisturizer" because it's what I use as a moisturizer in the morning, even though it's supposed to be a cosmetic. And I tend to find this stuff pretty thick, too, which is why I started to dilute it with my night cream. It's not perfect, and I still hold out hope that Kiehl's will bring back their tinted moisturizer. Please, Kiehl's! Pretty please!!! // 7. & 8. LA ROCHE-POSAY EFFACLAR DUO & BURT'S BEES BLEMISH STICK // I still get my hormonal moments, so I keep these on hand for the just-in-case. I picked up the effaclar duo on a tip from a friend, but later learned that La Roche-Posay isn't cruelty-free, so while I use up the last of it I'm on still the hunt for a better option--know of any? As for Burt, I will never stop loving the sting of that blemish stick. Die, pimples! Die!!! Special Note: I picked up a prescription for Retin-A the last time I saw my doctor (see also: apparently you can just get it on Amazon now?! ), and I can't say for sure whether it's any more potent than the RoC I was using before. FYI! Lifelong lover of rose water, right here. The best. Also, I just bought a different burt's bees blemish product - the targeted spot treatment from their acne solutions line - on a whim for my preteen son as a little valentine's gift, and so far he's loving it. I'll have to get him the blemish stick to strengthen his arsenal. Teenage hormones be damned! I read your blog regularly, but rarely comment and for whatever reason just want to say, thank you for your courage, authenticity, and radness. You're the best, Natalie. The best. I have never thought to wash my face with coconut oil. I whip mine into a frenzy making a semi butter and use it as moisturizer- but honestly it feels a little sticky, and sometimes I feel like it's cooking my face- reminds me of Kramer and the butter episode. Anyway, I'm so going to try it this way! As an alternative to the la Roche Posay, take a look at Pai skincare (natural/organic). They do a blemish serum with zinc, it's really lovely and work pretty well. Oh, and does not test on animals. You have gorgeous skin! I love the idea of using Coconut oil. Have you checked your other stuff to make sure that it doesnt test on animals. I just found out that some of my "natural" products test on beagles and bunnies in China. Check out the PETA website. I would love to try the konja sponge and as a fellow nose ring wearer, I dread the "catches" from towel like exfoliators. Talk about bringing water to my eyes. I'm welling up now just thinking about it. My bf is a dermatologist. He says that over-the-counter retin-a isn't nearly as potent as an rx. There is a wide range of retin-a rxs that vary in strength (over-the-counters cant pass a certain threshold). He usually recommends Differin (adapalene) to most people as its a more mild retin-a rx. Some people can experience redness/irritation from retin-a, so he recommends using it every other or every two days. 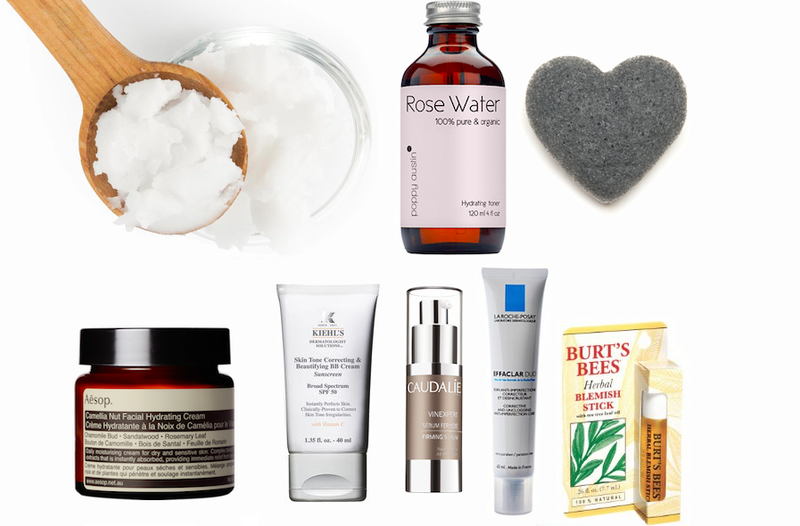 Mix it with or put it on after your nighttime moisturizer. You have to use it (or any other skin product) consistently for 28 days to see any results, as that's the life cycle of the skin. Along with wrinkles/firmness/color evenness, retin-a is helpful for breakouts/acne. I'm not sure about use if you're trying to get pregnant....? i went and googled it! retin a is a class c, so i suppose one of those situations where i'd probably stop using it if i got pregnant but i wouldn't worry about it too much before then. I'm so sad that I'm only now learning about the discontinuation of the kiehl's tinted moisturizer! That was my first foray into makeup (beyond mascara) and I've been considering giving it a try again. I'm so sad now! But I love that you're including some beauty stuff again on your blog because I really enjoyed some of your past beauty related articles. Wonderful, thank you so much for this list! I'll have to try some of these products soon as I've been meaning to change up my skincare routine for a while. Great advice! I've gone through way too many coconut oil jars! It's amazing for shaving as well! RT on the clarisonic + nose ring sitch, i'm dying to try this konjac sponge now. also the rose water! i've been trying to wean myself off bar soap (even all natch) but i'm so far in with it, it's been so haaaaard to kick it.